The Berkley Portable Line Spooling Station is a compact design with a hang tab that makes it easy to store or hang on a wall. This Station has a quick release reel system and fits most 3,000 yard spools. 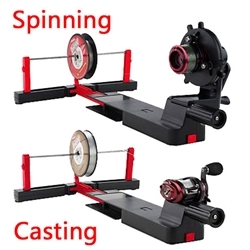 Great for spinning or casting reels and has a spring loaded arm that provides spooling tension. The spinning reel attachment eliminate line twists and saves you time.